Today´s organizations - faced with stricter internal security policies and regulatory compliance - continue to struggle to make Active Directory auditing simpler and better able to meet their requirements. But native Windows auditing mechanisms do not to meet the needs of modern businesses. 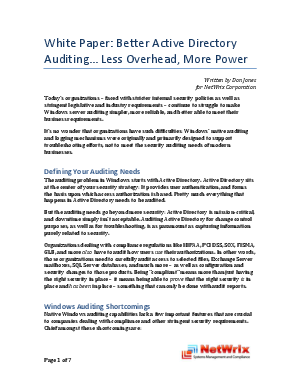 This white paper introduces several ways to extend the native auditing without dramatic changes in your IT infrastructure.